"I DON'T LIKE THE CUBS." The Cincinnati Reds (73-54) will play the Chicago Cubs (54-74) for the final time during the 2010 season beginning on Friday for three games. The Cubs are currently 19.5 games behind the first place Reds in the NL Central standings and have recently lost their manager Lou Piniella. Planning on retiring after the Cubs' 2010 season, Piniella decided to call it quits on August 22 after a 16-5 loss to the Atlanta Braves to care for his ailing mother. Ironically, the Braves defeated the Cubs by the same score during both teams' 2010 season opener on April 5 in Atlanta. The Cubs have unloaded mightily during this year's disappointing season. Lefty Ted Lilly and 2B Ryan Theriot were both traded to the Dodgers right before the non-waiver trade deadline. Mike Fontenot was traded to the Giants on August 11 and long time Cub, Derrek Lee, was traded to the Atlanta Braves on August 18, just five days after a visit on the bereavement list. During Lee's seven seasons with Chicago he batted .298, collected 1,046 hits, and belted 179 homers. 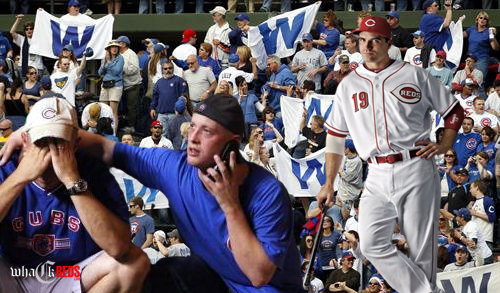 The Reds have played the Cubs during every month this season except June. In thirteen attempts, the Reds have won ten, while outscoring Chicago 85-43. Collectively against the Cubs this season the Reds have batted .282 with 128 hits and eighteen home runs. The Cubs on the other hand, have hit just .220 when facing Cincinnati with 93 hits and eleven long balls. Making his 25th start of the 2010 season, Johnny Cueto will be searching for a career-high in wins (2008: 9-14, 2009: 11-11) on Friday night against Chicago. Cueto has faced the Cubs just once this season, walked a season-high five Cubs, and received the loss (5IP, 7H, 0ER) as the Reds were defeated 3-1. In nine career starts against Chicago North, Cueto is 2-5 with a 4.17 ERA. Tom Gorzelanny has faced the Reds nine times during his career. Lifetime, Gorzelanny is 3-4 against Cincinnati with a 4.74 ERA. Gorzelanny has faced the Reds three times this season and was handed three losses as he allowed six runs in 19.1 innings. On Saturday, Bronson Arroyo will make his 27th start of this season and his 20th career start against the Cubs. During nineteen career starts against the Cubs, Arroyo is 9-6 with a 2.74 ERA. Arroyo has faced the Cubs twice this season with both being at Wrigley Field. In thirteen innings, Arroyo failed to allow a run against Chicago (7H, 3BB, 10K) while walking away victorious during each attempt receiving his eighth and twelfth wins. Also making his 27th start of the season, Randy Wells will be facing the Reds for the seventh time during his four-year career. Lifetime, Wells owns a 3-1 record against Cincinnati with a 2.58 ERA. During two starts against the Reds this season, Wells is 1-1. In 14.2 innings, he allowed four earned runs on ten hits while striking out eight. After three solid starts from August 1 to August 13 in which he allowed just one run per game and received two victories, Edinson Volquez's progress declined rapidly. During his last two outings, Volquez pitched a measly 5.1 innings while allowing ten earned runs on eleven hits. Volquez will likely get one more redemption start against Chicago on Sunday before the Reds decide his 2010 fate. On August 7th of this year, Volquez pitched 6.2 innings of one-run ball against Chicago during the Reds' 4-3 victory at Wrigley Field. Lifetime against the Cubs, Volquez is 2-0 with a 0.96 ERA in three starts. Volquez has yet to allow a Cub homerun. Keep it that way. Rookie long-reliever turned starter, Casey Coleman, will be making just his third career start on Sunday. Coleman has faced the Reds just once during this season. On August 8, Coleman pitched three innings (2H, 2ER, 2BB) during the Reds' 11-4 victory. *Update: Tom Groeschen has reported that Edinson Volquez will not start for the Reds on Sunday and will be moved to the bullpen for the time being. Travis Wood will be moved to Sunday, Homer Bailey will be moved to Monday, and Aaron Harang appears to be starting for the Reds on Tuesday. Travis Wood made his major league debut against Chicago on July 1, 2010. In two starts against the Cubs this season (the Reds won both games), the rookie received one victory as he pitched 13.1 innings and posted a 3.38 ERA.